The $93.9bn top-line projection for total IoT systems sales in 2018 remains unchanged from the original MD18 forecast released in November 2017, but dollar volumes in end-use categories were adjusted due to slight changes in expected growth rates and also because $2.5bn in revenues were reclassified and moved from the large connected cities segment to the broad-ranging Industrial Internet group, which covers most commercial applications, including medical. IoT systems revenues for industrial Internet applications are now forecast to grow 17.7% in 2018 to $35.9bn, while the connected cities segment - covering government-funded infrastructure, 'smart' roadways and bridges, streetlights, power grids and other utilities, public-safety video security networks, environmental and weather monitors, and other systems - is expected to increase 7.0% this year to $38.8bn. The strongest growth in 2018 is still expected to occur in the IoT-connected vehicle category, which is forecast to rise 21.6% this year to $4.5bn. IoT sales generated by connected home systems are forecast to grow 16.0% in 2018 to $2.9bn, while the wearable category (including Internet-enabled smartwatches and medical units) is expected to rise 12.4% to $11.8bn this year. 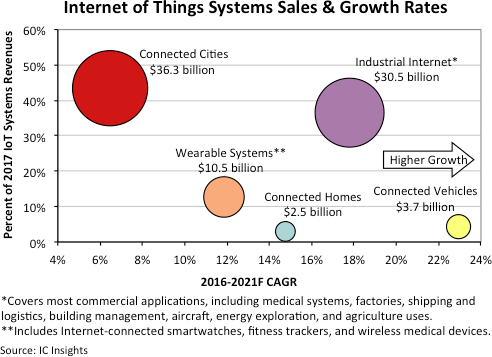 The report’s update lowers the projected 2016-2021 sales growth rate in three IoT end-use market categories with wearable systems going from a CAGR of 12.8% to 11.9%; connected homes applications dropping from a CAGR of 16.8% to 14.8%; and the industrial Internet segment being eased back from a CAGR of 18.7% to 17.8% in the five year period. The sales growth forecast in connected vehicle systems remains unchanged at a strong CAGR of 22.9% between 2016 and 2021. Automotive Internet applications are accelerating as carmakers race each other to add more automated controls and driver-assist features for greater safety and create vehicles that are aware of their locations, road conditions, and changes in weather as well as communicate with each other. The five year growth forecast in the connected cities category has been raised slightly, going from a CAGR of 6.3% to a 6.5% annual rate of increase in the MD18 update (Figure 1).